What Are the Steps to Getting Maximum Soil and Spot Removal from Your Carpet and Upholstery? Do you sometimes get the feeling that the carpet or upholstery cleaner is “leaving something out”? Have you ever had a carpet cleaner race through your cleaning job, leaving you to wonder how he could have possibly gotten everything out? It “looks” clean, but what will re-surface in the near future? There are actually 7 important steps to cleaning any textile, whether it is carpet or upholstery. Many cleaners don’t use these steps, therefore leaving a soaking wet mess behind. In this step, a solution is applied that loosens the soil and spots for more effective removal. Some spots require special solutions and special care for complete removal and to avoid “setting” the stain. The carpet or upholstery pile is now gently massaged to further loosen the soils so that aggressive, harmful cleaning is not needed. Now that the soil has been properly “suspended”, it can be extracted without over-wetting or leaving a sticky residue behind. Stubborn stains sometimes require specialty stain removal processes. Because many cleaners do not train themselves, they do not know about these processes. Those who do sometimes gouge customers to use these processes because they offer a low price they intend not to keep. The pile of the carpet or upholstery should then be “finished” so that it dries and cures in the proper direction. A thorough walk through should be done to insure that you are completely satisfied with your cleaning job. Quality Carpet Cleaning uses all these steps. 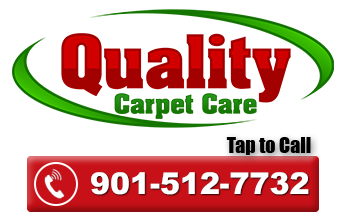 Call 901-212-9619 For a Free Estimate.